No one saw it coming? A sound banker, alas, is not one who foresees danger and avoids it, but one who, when he is ruined, is ruined in a conventional way along with his fellows, so that no one can really blame him. John Maynard Keynes, 1931. Q404 Mr Fallon [Treasury Committee, Conservative Member of Parliament]: But a heavily leveraged bet on the movement of interest rates and on capital markets remaining open for an over-exposed model like this seems to me a fairly basic banking error, is it not? Dr Ridley: We were subject to a completely unpredicted and unpredictable closing of the world credit markets. Our model was entirely transparent to the market and to the regulator. It was discussed regularly with both and it was not at the time seen as running a particularly high risk in terms of liquidity. Q405 Mr Fallon: But it was your duty as Chairman and as a Board to ensure that your bank was liquid. Dr Ridley: We reviewed liquidity regularly and we reviewed our policy on liquidity and our policy on funding regularly. Q406 Mr Fallon: But you were wrong? Dr Ridley: We were hit by an unexpected and unpredictable concatenation of events. Q407 Mr Fallon: So you are the Chairman of a bank that ran out of money and that caused the first bank run in this country for 150 years; you have had to borrow billions of pounds of public money from the Bank of England; you have damaged the good name of British banking; why are you still clinging to office? If you grow risk by 25 per cent and profits and capital by 15 then either you will run out of capital and the regulators or rating agencies or bond markets will not allow you to fund your growth – in which case the growth fizzles out at best, or you will eventually be taking so much risk that the return on capital will not be rational in an ex-ante basis. Some point ex post you will blow up, possibly spectacularly. Crucially, the credit markets knew very well that Northern Rock was an exposed outlier, which led to the company being the first among all the British banks to fall. 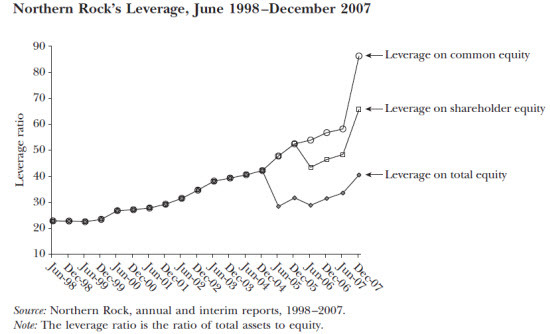 According to Shin (2009), the common equity leverage of US investment banks in mid-2007 was in the range 25-30. The final uptick of the hockey stick graph after June 2007 was caused by the share price collapse in the Fall of 2007. Perhaps any warnings of a housing bubble were dismissed in the boardroom as model-based speculation; perhaps cautions about unsustainable growth were said to be unduly alarmist; perhaps even hockey-stick graphs showing Northern Rock’s growing leverage were scoffed at as being statistical artifacts; anybody silly enough to speculate that liquidity risks could lead to a bank run would have been laughed out of the boardroom. 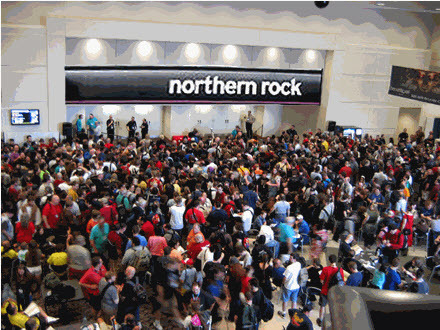 However, as events unfolded, Northern Rock’s shareholders, creditors, customers, and the British taxpayer would surely have concluded that their interests would have been better protected had there been a few rational pessimists on the Northern Rock board of directors. Matt Ridley has been highly critical of the IPCC reports and of the Chairman of the IPCC, Rajendra Pachauri, mainly for the overblown stories about the Himalayan glaciertypo and the poorly-referenced but correct accounts of the Amazon Basin’s vulnerability to drought. Yet for all the accusations that the IPCC has exaggerated impacts of climate change and “sexed-up” summaries for policy makers, its track record is solid compared to the rosy business outlook that Ridley portrayed in the Northern Rock Annual Report 2006, and published in early 2007, just a few months before the company failed. Two senior officers of Northern Rock—the Deputy Chief Executive and the Managing Credit Director—were heavily fined in April 2010 by the UK Financial Services Authority for hiding the decline in the performance of the company’s mortgage assets in early 2007. There’s no suggestion that Ridley played any role, or, at the time, was even aware of this misrepresentation of important financial data. All the same, the transgressions happened under his watch as Chairman and, as far as I know, he has not since expressed any regret for the incident. Nevertheless, a few months after his former colleagues had been sanctioned, Ridley had the audacity to write an article for the Times in which he referred to the “discredited Dr Pachauri” in “shut-eyed denial”. Yet none of the contributors to Chairman Pachauri’s reports has ever been shown to have deliberately misrepresented any data. But what made the bubble of the 2000s so much worse than most was government housing and monetary policy, especially in the United States, which sluiced artificially cheap money towards bad risks as a matter of policy and thus also towards the middlemen of the capital markets. The crisis has at least as much political as economic causation, which is why I also mistrust too much government. Over the past few years it has gradually become clear to me that climate change is a nosebleed, not a severed limb, and that the remedies we are subsidising are tourniquets round the neck of the economy. From the Northern Rock 2006 annual report. For Ridley, in business as in climate, prudent precautionary measures are rejected as ruinous, whereas warnings that real disasters may be lurking are dismissed. As the Northern Rock experience showed, being dazzled by the power of virtuous circles can blind you to the fact that, if spun too hard, they can quickly turn vicious. This entry was posted in Soft Science and tagged Ridley. Bookmark the permalink.